Los Angeles County boundary sign eastbound on California Highway 126. Photo from Google Maps, Copyright 2017 Google. Thence south along the range line between R. 8 and 9 W., to the southeast corner of Sec. 12, T. 2 S., R. 9 W., S. B. M., said corner being an angle point in the boundary line of the Rancho Santa Ana del Chino; thence westerly, southwesterly, southerly, easterly, and southerly along the boundary line of the Rancho Santa Ana del Chino to the southwest corner of the Rancho Santa Ana del Chino, said corner being the center of Sec. 35, T. 2 S., R. 9 W., S. B. M.; thence southeasterly in a straight line to a point in the south line of Sec. 36, T. 2 S., R. 9 W., S. B. M., distant 52.84 feet easterly thereon from the southwest corner of said Sec. 36, said point being common to the boundaries of San Bernardino, Orange, and Los Angeles; thence westerly along the northern line of Orange to the southeasterly corner of Tract No. 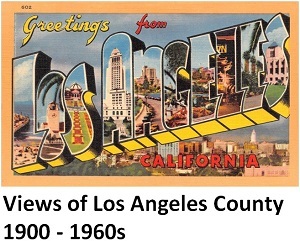 46685 filed in Book 1209, pages 56 and 57, of Maps, in the office of the Recorder of the County of Los Angeles, said southeasterly corner being common to the boundaries of Orange and Los Angeles; thence northerly following along the boundary of said Tract No. 46685, the following courses: north 13*53'07 east 100.12 feet, north 76*01'25 west 1018.58 feet, north 85*34'56 west 163.25 feet, and south 00*57'29 west 47.01 feet to a point in the northerly line of Tract No. 25335, filed in Book 775, pages 35 and 36, of said Maps, said point distant westerly along said northerly line 10.26 feet from the northeasterly corner of said Tract No. 25335; thence northwesterly following along the boundary of said Tract No. 25335 the following courses: north 76*00'59 west 1224.52 feet and south 00*52'39 west 564.75 feet to a point on the boundary common to Orange and Los Angeles; thence westerly along the northern line of Orange to the southwesterly boundary line of the State of California; thence northwesterly along the southwesterly boundary line of the State of California to the point of beginning. Also the islands of Santa Catalina and San Clemente.